or this one could be subtitled 'my brush with quilt-as-you-go disaster'. For a while last year, when I was trying to figure out what sort of quilter I was (of which more another time) it bothered me that other people seemed to be producing a quilt a week, while I was more like a quilt a year. So I read blogs, and looked at tutorials and came to the conclusion that quilt as you go was the answer - no more hand stitching for me, just nice little blocks whacked through the sewing machine. Oh what a bad idea it turned out to be. No matter what arrangement I tried, still a pile of poo. I think because my blocks weren't of a uniform size I couldn't make the whole thing look balanced. I hated it, but there was a lot of fabric committed there and I didn't have enough to start again, so somehow it had to be rescued. After a week of looking at it and feeling very grumpy I decided to keep some blocks and work out what new ones I would need to balance it all better. The reject blocks were chopped up and then added to, to make new chunks, so in the end everything that's in these pictures, bar one little rectangle, ended up in the final quilt. Than my next disaster. I put the first block under the machine, quilted it, and hated it. Put the second block under the machine, quilted it and hated it. Said to anyone who would listen, 'I hate how this is looking'. Mostly they said something along the lines of 'it'll be fine...' but I quilted another block and hate, hate, hated it. So I unpicked it. Every last tiny machine stitch pulled out. It took me days! Much longer than doing it in the first place. At this point I nearly gave up on the whole project. Weeks wasted on the miserable thing. But I stuck to it, returned to handquilting, and (months later of course) finished. In the end I liked it, but definitely no more quilt as you go for me! Linking up with Fabric Tuesday at Quilt Story and Needle and Thread Thursday at My Quilt Infatuation. Your quilt is beautiful, worth every second spent on it. It's really all handstitched? I am really impressed. I am glad you stuck with it. It turned out great. Congrats. Thank you, I'm glad you like it. Handstitching with perle is quicker, I think, and it's not a big quilt. Thank you - I love the fabrics too. Certainly doesn't look like a pile of poo any more. 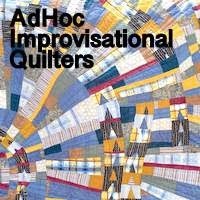 It's a really striking original quilt. The two bands of strips down each side contain the whole design, a modern look but hand quilted... definitely one of a kind and well worth the agony. And I've just read your entire blog, start to finish. Gripping stuff. I've got a mini stash of Oakshott too. Just finished a project using some nice blue from them, which is going to be my next blog post. Bet you thirty five million quid you will have a bit of a surprise. That is Wonderful quilt. It's really all hand stitched? I am really impressed your work!!! !